Do you recom­mend gluing the scope into the mount? As an alter­na­tive to gluing scopes into the mount in order to achieve a secure hold, we recom­mend the use of little pieces of latex cut out of a medical glove, which can be placed in the ring-halves to provide a very secure bond between mount and scope. Unlike glue, this latex ring is easy to remove and leaves no residue. Can the ERATAC mounts also be clamped on Weaver rails? No. Clamping is only possible on Picatinny rails. What’s the differ­ence between the Picatinny stan­dards STANAG 4694 and Mil.Std. 1913? More infor­ma­tion about the Picatinny stan­dard can be found here. When do I need a one-piece mount with 2“ or 3″ exten­sion? 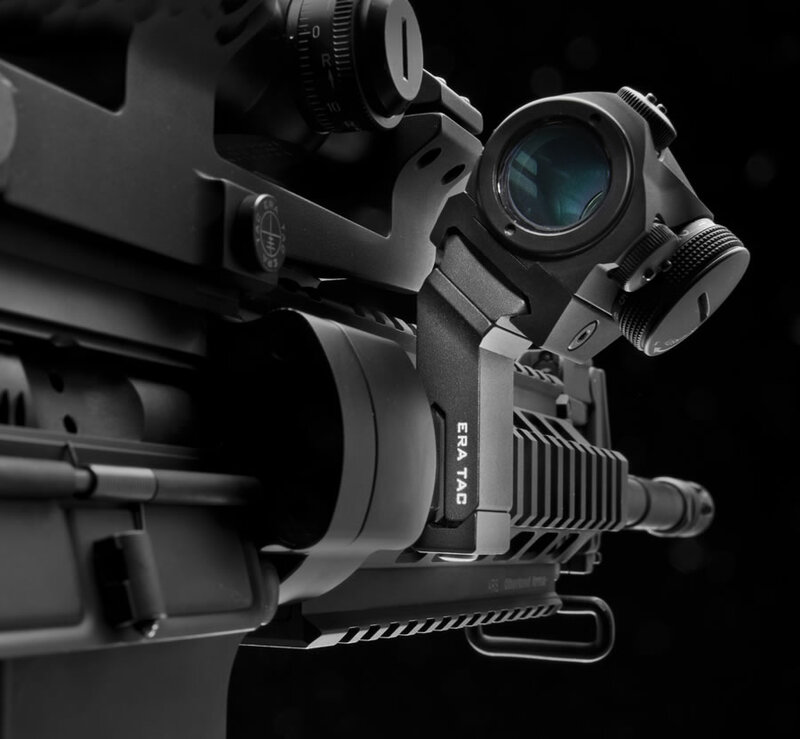 Primarily on AR15 guns to main­tain proper eye relief. MOA (Minute of Angle) means angle minute. 1 MOA equals 0.0166 ° or 2.91 cm at 100m distance. Is it possible to also use KeyMod acces­sories for H-Key? No! These are similar, but different fixing systems and they are not compat­ible. You have not found a suit­able answer? What torque can be used to fasten the two torx (T25) screws of the Ultra­light one-piece mount to tighten it onto the Picatinny rail? Both screws can be tight­ened with 7-8 NM. This value is also engraved on one side of the clamp jaws of the extended Ultra­light mount or on the bottom side of the short Ultra­light mount. With what tight­ening torque can the fastening screws for the upper half shells be tight­ened? Due to the differ­ences in mate­rial and wall thick­ness of the tubular body, we can not give any infor­ma­tion about the tight­ening torque of the fastening screws of the upper half shells. What tight­ening torque can be used to tighten the 11mm hex nuts for clamping on the Picatinny rail? The hex nuts can be tight­ened with 10-12Nm. This infor­ma­tion is also engraved on the hexagon nuts. With what tight­ening torque can the attach­ments for UNIVERSAL inter­face be tight­ened? The attach­ments for UNIVERSAL inter­face can be tight­ened with max. 1.5Nm. How long is the delivery time for an article with CERAKOTE coating? The delivery time is usually 6-8 weeks, in addi­tion to the stan­dard delivery time. How much does the CERAKOTE coating cost for an ERATAC product? The prices for the coating are not listed in the price lists. They depend on the type and number of the ordered item. Please send us a price request by email. Can I also order prod­ucts directly from RECK­NAGEL as end customer? All prod­ucts from the current ERATAC catalog can be ordered through specialist dealers, gunsmiths or directly from us. Send us your order via email with the required order numbers, your address and phone number. Dealers and gunsmiths attach a copy of their busi­ness regis­tra­tion and / or arms trading license to the first order. Compa­nies from other Euro­pean coun­tries also need a valid VAT number (UID). You can send us a request via email or fill out the word “Price list” in the remark field when you request a catalog. The price list will then be attached to the catalog. How can I pay as a private customer? Basi­cally, only one payment by cash on delivery is possible.